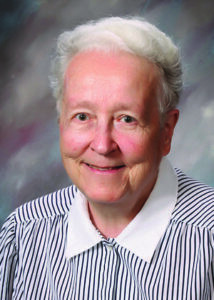 Sister Marion (John Patrice) Murphy, BVM died Thursday, Nov.15, 2018 at Caritas Center in Dubuque, Iowa. Visitation, Sharing of Memories, and Mass of Christian Burial were on Tuesday, Nov. 20, 2018, in the Marian Hall Chapel. Burial is in the Mount Carmel Cemetery. She was born in Chicago on March 14, 1936, to John Joseph and Edna Conway Murphy. She entered the BVM congregation Sept. 8, 1953, from Our Lady of Angels Parish, Chicago. She professed first vows on March 19, 1956, and final vows on July 16, 1961. Sister Marion ministered in Chicago as an elementary teacher at Blessed Sacrament and Our Lady of Lourdes; principal at Blessed Sacrament and Our Lady of Angels, pastoral coordinator and administrative assistant at Holy Family Parish, tutor at the Westside Employment Education Center (WEEC), and volunteer at the Holy Family Parish food pantry. She was principal at Sante Maria del Popolo ES in Mundelein, Ill., and teacher at St. Odilo in Berwyn, Ill., and St. Cecilia, in Portland, Ore.
She was preceded in death by her parents and brothers Robert, John (Mary), Raymond Patrick (Esther), Donald and Edward. She is survived by a sister-in-law June Wetton, Schaumburg, Ill.; nieces, nephews; and the Sisters of Charity, BVM, with whom she shared life for 65 years. My deepest sympathy and prayers are with the B.V.M. Sisters upon the death of dear Sister Marion Murphy. Sister and I lived near each other, growing up in Our Lady of the Angels Parish. Her cousin, the late Bishop Ed Conway, also lived nearby. I do remember when she became principal of OLA in the new School. I also fondly remember visiting her at Holy Family Parish in Chicago. She gave of herself, as a dedicated Sister, in so many way. We shall all miss her and will especially remember her as we participate in the 60th Anniversary Mass at OLA on Dec. 1. I have known Marion since 1966, when we lived together in Blessed Sacrament Convent. She re-taught me how to drive on the streets of Berwyn, and always took time to get to know me. When I left the community, Sister asked me to teach at Blessed Sacrament. I was delighted. Through the years our friendship grew. After I retired from teaching I began working at the Holy Family food pantry with Sister Marion and Sister Otile. Marion was a hard worker who spent her life helping the less fortunate. May she stay in our hearts. Sister was the Angel of Mercy and Charity for thousands of the Poor on the West Side of Chicago. As her funeral is taking place, we are distributing turkeys for that same group of poor people. This is something she did for decades for those suffering from hunger. She also created a GED program for those in need. So many things she did! We love you Marion, especially the Poor. Sr. Mary John Patrice was my 1st grade teacher at St. Cecelia in Portland Or in 1957 1958 school year. Yes the school name was spelled St. Cecelia not St. Cecilia. Those who had Sister Marion Murphy-Aunt Cookie in their life were truly blessed! She instilled in all the goodness of life by example. While she is now on her grand tour of the Celestial Kingdom may her spirit live on through our memories of her! While it is a sad time reflect on the goodness she brought so many including me.